Mansfield Town boss Adam Murray admitted his gut feeling is that star centre half Ryan Tafazolli will leave the club this summer. 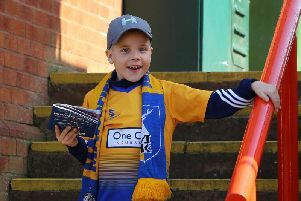 Tafazolli limped out of today’s 0-0 final home draw with Cambridge United at half-time, and fans were left wondering if they will ever see him in a Mansfield shirt again. The Stags have put together the best package they can offer to their out-of-contract defender, but Murray knows offers will come in they can’t match. “I can’t give a factual answer as I don’t know the facts, but my gut feeling is, yes, he will probably move on,” said Murray. “But I though Lee Collins and Krystian Pearce were superb second half, so there are a lot of good footballers out there. “Taff has been brilliant for this football club and he’s put a right shift in. If he decides to move on, the chairman can’t do any more to put a deal together for him. “It’s one of the best deals I’ve seen and fair play to the club for doing that. “Ultimately he has to make a decision. Taff is not someone who is financially driven. He just wants to play as high as he possibly can. “In my opinion he’d gain more from playing another season in League Two and becoming the division’s best defender. He still has a lot to work on. But he is ambitious and has a lot of drive. On the game, Murray said: “It was a battle. I thought first half we looked a little ‘last game of the season-ish’ and sluggish. “Then I thought second half we upped the tempo and our standards and probably did enough to win the game. Youth team striker Zayn Hakeem made a lively second half debut and Murray said: “I thought he was excellent. We had to throw him an energy gel on 10 minutes after coming on. It’s an emotional moment when you first come on. “I remember that moment when I first came on myself and I was actually sick after 10 minutes. “It drains everything out of you. You are trying to run around but emotionally you have the whole occasion to deal with. “I think if he got that opportunity that fell to him after two minutes, if he’d been on longer he’d have scored as he is a goalscorer. But I thought his hold-up play was top drawer and he gave a lot of energy to us. Murray looks set to announce his retained list this week. “It will be this week. I am not going to mess about,” he said. “We have a couple we need to dot the i’s and cross the t’s, but the majority should be done by mid-week. “I need to switch my brain off. I’ve not stopped for 18 months. I need a few days to review and shut off from the club. I need to review the season and review myself. “I think it’s been a very good season. We are fine lines away from being an excellent team. “Where we’ve come from in such a short space of time, it’s credit to the players. They are the ones that have carried it out. “From nearly being relegated to finishing in the top half and being in with a shout of the play-offs until a few games ago, it’s been a massive step for us.